Enjoy constant heat and hot water without worrying about large energy bills. You can save money with a ground source heating system that uses a renewable energy source. Using the Earth’s constant temperature as an energy source, building energy consumption and associated emissions can be reduced by more than 40% when compared with air source heat pumps and by over 70% when compared with electric resistance heating and standard air conditioning. How do Ground Source Systems Work? The earth is a huge solar collector, absorbing 47% of the sun’s energy, more than 500 times more energy than mankind needs, every year, in the form of clean renewable energy. Using conventional heat pump technology and a ground loop heat exchanger, low grade heat is drawn from the earth and transferred to a fluid inside the ground loop, buried underground. The fluid then travels along the loop to the heat pump through a compressor where the temperature is raised to provide heating and hot water. For cooling the process is reversed with heat being rejected back into the earth. Ground source energy is a renewable resource. In the heating cycle, a ground source system will move at least 3 kW of energy from the ground for each 1 kW of electricity used by the heat pump. In the reverse cycle the same heat exchanger rejects excess heat to the earth at similar returns. No requirement for on-site fossil fuel consumption. 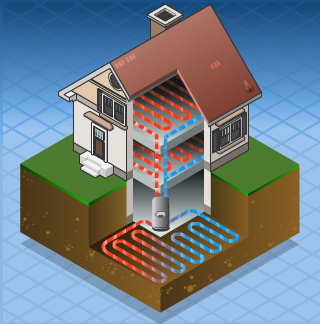 Where can ground source heat pumps be used? A ground source heat pump system can be applied to almost any building in any location. You don’t need a particularly large area to install a ground loop but if space is restricted we can install a vertical loop down into the ground. A depth of up to 100 metres is typical for a geothermal system in a domestic property. You may be able to receive payments for the heat you generate using a geothermal heat pump through the government’s ‘Renewable Heat Incentive’ (RHI). This scheme is expected to launch in October 2012. From August 2011, you may be able to get help with the installation costs of a ground source heat pump through the ‘Renewable Heat Premium Payment Scheme’. Please get in touch for more details about geothermal energy on your property.